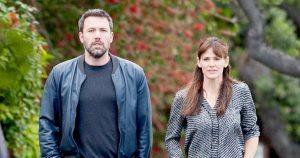 Although reports emerged that the recently divorced actor, Ben Affleck was hitting the dating scene, an insider says that Affleck is not dating anyone seriously and he is still working on his relationship with Jennifer Garner. Following the couples’ split in 2015, Affleck has since moved out of their family home and is now co-parenting their children. The couple only filed for divorce in April this year after the 10-year marriage ended. The court documents state that the pair has filed for joint legal and physical custody of their children, which would mean that the couple is working together to make sure that their new living situation is manageable. The couple first announced their separation by saying that they had carefully considered their options and that divorce was the best decision for both parties and their family as a whole. They continued to say that they will move forward with love, friendship and a commitment to their children. The couple wants to make the transition easier on their children and therefore have decided that their children will remain in their family home. To make the transition easier on their children they have decided to take turns dropping and picking their children from school, taking them on outings and making dinner. Their amicable divorce has been classy and helped to maintain a good relationship between the pair and their children. Entertainment What Differentiates an Executive Producer from a Producer?